Notifies the extension that a message has arrived. Viewer extension class Describes a Second Life viewer extension. Definition at line 72 of file llviewercommunication.h. const LLString & description = ""
Definition at line 84 of file llviewercommunication.h. Definition at line 87 of file llviewercommunication.h. Definition at line 90 of file llviewercommunication.h. Definition at line 91 of file llviewercommunication.h. Definition at line 89 of file llviewercommunication.h. Definition at line 92 of file llviewercommunication.h. circuit Circuit between viewer and object. Used to reply to the request. Definition at line 99 of file llviewercommunication.h. Definition at line 102 of file llviewercommunication.h. Definition at line 106 of file llviewercommunication.h. Definition at line 103 of file llviewercommunication.h. Definition at line 101 of file llviewercommunication.h. 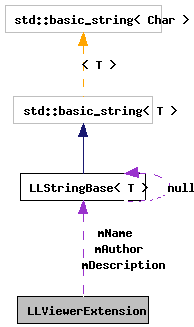 Referenced by asString(), and getName(). Definition at line 107 of file llviewercommunication.h. Definition at line 104 of file llviewercommunication.h.